@robou Can you give me a maintainer so I might be able to make WQGF work again? I was using World Quest List, but it was kinda iffy to type all those numbers in while moving and not falling in rivers or cliffs. Started using World Quest Party instead. Functionally works as good as WQGF ever did, just go to the WQ area and find/join or create party. It's nice and easy. This is why I didn't buy BFA and let my subscription die. It really is sad, but WoW would be so much better than it was if Blizzard abandoned the project AND stopped protecting their IP, allowed private servers to just exist. I think the structure of Blizzard/Activision must just prevent any situation where people who know what they are doing and enjoy the game can ever have control, the game always gets worse and just straight up having access to Wrath, or whatever expansion (they'd all be available) even if it isn't being developed, it's not like the 'development" is taking the game anywhere it ever ought to have gone. can you still use this in patch 8.0? yea im praying for this to make a comeback. I know WQT and WQL both have the feature to auto join so it is doable still. Unfortunately both also come with a ton of bloat im not interested in. Can we get an update for the Battle of Azeroth Expansion? We now have a lot of unlocked playable races that we would like to level, and this would make it much easier. This has been the most important add-on tool for Legion in my opinion... to loose it now would be awful. 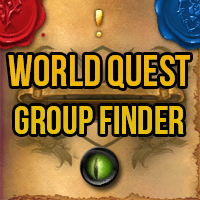 World Quests List has found a way to simulate WQGF after the prepatch changes although a little less easy. Still works but not as many people using it yet. Oh My God! Has blizzard made this awesome addon obsolete for Legion Invasions and for BfA???? WHY???? Some of the elite quest in BfA can only be done by two or three people and waiting around for hours for help is not cool. What's a girl to do? Thank you for the addon. Such a shame blizzard decided to make world empty and game single player again... They're gonna regret that later. Was a big help getting groups for the elite and boss level worldquests. Sad to see it being destroyed by blizzard without any (convincing) explanation. Blizzard is grp of retarded idiots, ty for your work on this addon durning legion. I have a wish though, Can you add an option to "Scale it"
- The Window when it pops it like 1/6th of my screen, ENORMOUS... i want to reduce it by 50%. If this cute allon will be updated ever, it will be cool to change language it`s use on quest status change.. Or set language to party leader's server.. for EN servers to use english, for RU servers to use russian language.. In reply to zarimal: I wish the addon can be supporting Swedish Language aswell.